Ziontech would like to introduce the latest member of the Ziontech family. 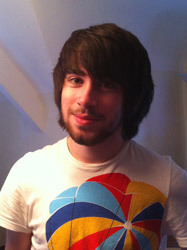 Sam Giles came to us fresh from finishing his studies at Yeovil College and started work as a web developer in July 2011. As well as working for us he is also doing a 3-year Foundation Degree in Computing and Internet Technology at the University Centre Yeovil. Sam likes noodles and has a tendency to think everything is ‘awesome’.